Tommy Lee Jones finally laughing! The 85th Academy Awards are this Sunday night. There are some powerful nominees this year, albeit with the absence of “The Dark Knight Rises.” Understanding its dark cloud, it is still odd that not even its soundtrack/sound was acknowledged. Fans know the quality of the film, which is perhaps most important. Will Daniel Day-Lewis be the first former Republican President to receive a standing ovation in Hollywood? Did Sally Field prove that she is not only still one of the finest actresses in Tinseltown, but literally the best from this past year…for the third time!? Will Argo take home the Oscar for Best Picture? If so, will Ben Affleck be the primary speaker? What tone will he strike? Does Seth MacFarlane become a household name or remain a comedy writer and producer within his already existent niche market? What is Hollywood’s real opinion regarding the true story of tracking down and killing Osama bin Laden? The Navy Seal who shot bin Laden said Jessica Chastain’s portrayal of Maya was, “awesome.” He added, “They made her a tough woman, which she is,” he said. Will his endorsement of sorts mean anything? And quite possibly the most important question pondered each year: Will the best individuals and films actually win? Forget flowers this year. Instead, go with the “saving a group of innocent people from a bus with a bomb attached to it” move. It shows a little more creativity! These are two of the more popular attempts of pronouncing the name of my collegiate alma mater: Quinnipiac University (FYI-“QUINN-uh-pea-ack” in one smooth breath). My first visit to the university was in the middle of winter and it was so frigidly cold the temperature had to have frozen somewhere in the single digits. There was snow, but not the 40” avalanche that recently descended on the Hamden area. I loved it then and continue to love it today with nostalgia. Speaking of which, I was a broadcast journalism major, focused in sports, and covered numerous sports teams during my four year residence, one of which was men’s ice hockey. This team was particularly exciting because it was the most popular sports team on campus and therefore created an incredibly electric atmosphere for each of their icy battles against the best of the Ivy League and others in the ECAC. While there were some thrilling moments from my time as a student, those teams may have been more responsible for building the foundation for what is transpiring during the 2012/2013 season thus far with the same head coach at the helm, Rand Pecknold. 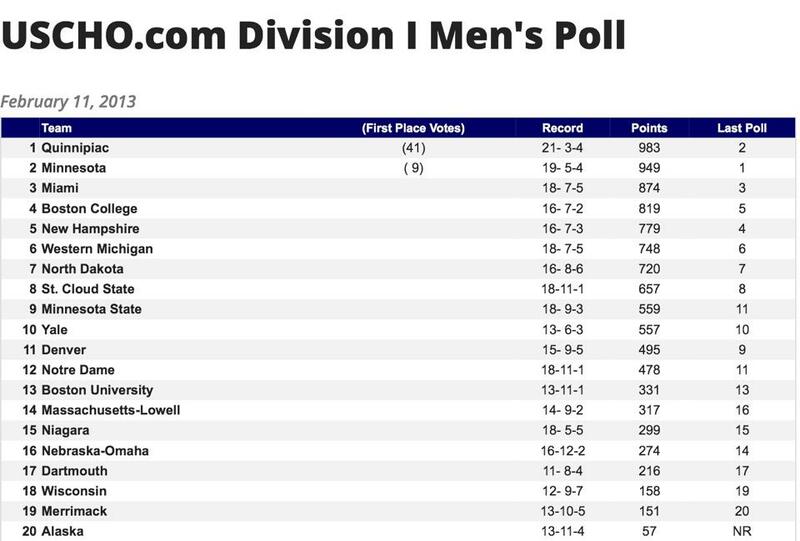 Quinnipiac is currently the #1 college hockey team in the country! For all of us alums, this is not only amazing, but also quite a bit surreal. To see them listed in the top spot atop the giants of college hockey from around the United States is truly a sight to witness. To quote from a local Ohio favorite of mine, “With a name like Smucker’s, it has to be good®“. To my fellow Bobcats past and present, we all could substitute our beloved college into that phrase and it too would be a perfect fit. For those who are studying and have graduated from this university, the word “Quinnipiac” signifies many things: Relaxing on the quad on a Saturday or Tuesday afternoon, studying in groups at the iconic Arnold Bernhard Library, ordering a mouthwatering bacon, egg and cheese sandwich from the cafeteria after an 8:00 a.m. science class, adventures in New Haven on Friday & Saturday nights (Toads! ), socializing in the many dorms, dressing up in a pink skirt and a tight pink tank top and singing “Man, I Feel Like a Woman” in front of all the fraternities and sororities with two happy backup dancers (my picture made the yearbook!) and so on. Now, Quinnipiac also means the best men’s college ice hockey team in the country.